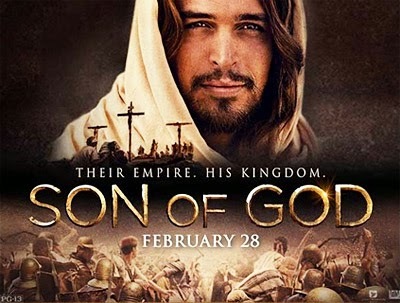 During the icy weekend of February 28, 2014, my three middle-school aged children and I braved the latest snow storm to attend the opening weekend of the newest Christian-themed movie, Son of God, an excerpt really from the television series The Bible. Munching through our refillable tub of popcorn and sucking down our blue slurpees, we reveled in the movie theater experience. This outing was one so super-rare, for a whole 7-8 years had elapsed since the last Christian-themed movie was released, The Nativity. Going to the theaters these days revolves around grown men wearing tights or giant alien robots duking it out, so seeing a movie about Jesus Christ on the big screen is an especially rare treat for us, and in scope, for the whole world. Afterwards, we slipped back down the snowy roads and fortunately returned home vehicle unscathed. I then proceeded to post on Facebook that we'd seen the movie and thought it was pretty good, and so recommended my Facebook friends go see it as well. What I wasn't prepared for was the second snow storm that was unleashed in all its blistering flurry by this innocent post; a storm I didn't make it through quite so unscathed. The second storm wasn't a storm by weather, though it was both chilly and super-heated at the same time, but a storm of negative reaction bordering on tempest fury. Did the severely negative reaction from my seemingly innocent post come from the God-haters who despise the very idea that there's a God who controls the universe? Nope, they seem to be totally unaware that the movie is even out. How about those protectors of the innocent who defend the children from too much television violence, such as one would naturally see during the crucifixion scene. Nope, they were all spent back when The Passion of the Christ came out years ago. How about the movie critics then? No, sadly Siskel and Ebert are dead (God rest their souls). Who hates the Son of God with the anger of a thousand blazing, burning suns? Why, it's the Evangelical Christians, especially those faithful who personally title themselves "Watchmen on the Walls." Needless to say, I was shocked by their negative reactions. Maybe it was the vitriol, but mostly to my utter dismay, it was because 99% of them hadn't even seen the movie, nor ever planned on seeing it. They hated it because they heard somebody's sister's brother's cousin three times removed blogged it was (and here comes that magic catch-all phrase so popular with evangelicals today) — apostate. The phrases "spiritual poison," "outright dangerous," "spiritually corrupt," "idolatrous," "the fake Jesus," "New Age Jesus" and "burn the witch" (no, wait, wrong movie) were the stones also thrown at this supposed cinematic adulteress. Not being an advocate at all of anything apostate to the Christian faith nor wishing to be slipping down any icy roads doctrinally, I had to make sure I understood that word correctly. Since it's been a few years since Bible school and seminary, maybe I didn't quite remember what that word means. So, I turned to the trusty Dictionary.com and to my relief found the definition — "a total desertion of or departure from one's religion, principles, party, cause, etc." — remains the same as it always has. The movie Son of God is supposedly a total departure from the Christian faith? How so? Puzzled I went looking into the reasons why these staunch anti-enthusiasts were giving this movie such an adamant "thumbs down" with the "apostate" label that would put it in the same category as Dan Brown's The Da Vinci Code, Martin Scorsese's The Last Temptation of Christ, and Paul Middleditch's Rapture-Palooza. Okay, here are the arguments detractors have made for why the movie Son of God is supposedly apostate and Christians should tell the movie-watching world, "Just say no." 1. Jesus is too handsome. Ah, yes, it appears only ugly actors should be cast into the part of Jesus. Portuguese hunk Diogo Morgado nor Person of Interest star Jim Caviezel need not audition. Isaiah 53:2 did prophesy that the Christ of the First Coming would be homely, "He had no beauty or majesty to attract us to him, nothing in his appearance that we should desire him." And yet, the Christ of the Second Coming in Revelation 1:12-18 portrays Jesus in all His majesty as white-haired with blazing eyes like fire, glowing feet, and with a voice with the force of rushing waters. Finding someone to cast who looks like the latter would be hard to come by, so Hollywood chose somewhere in between. Small blessings, for at least Hollywood didn't cast Dwayne "The Rock" Johnson! 2. Mary Magdalene was like a 13th Apostle. Having a woman follow Jesus around it appears was cutting into the authority of the Twelve Apostles. Who does she think she is? Oh, right, she's one of the women of Mark 15:40-41 who along with Mary the mother of James the younger and of Joseph, and Salome "followed him [Jesus] and cared for his needs." Jesus didn't have a money-earning job during his ministry time, and His apostles had all abandoned their careers to follow Him. Who paid for their food and clothing and like mothers took care of these men? It was these and other women. And, they were there traveling with them the whole time. 3. The story was from the Apostle John's perspective. John began the movie as an old man on the Isle of Patmos telling the story of his time following Jesus, just as Revelation 1:9 explains. Last I looked, the Gospel of John was the fourth of four Gospels. He also wrote I, II and III John and Jesus dictated to him Revelation. So, there shouldn't be any problem with John telling the story. Oh, Jesus was there with John on the island at the end of the story; that's the problem. No, it's not, not according to Revelation 1:1. Who is that "angel" who showed John the future? Check out Revelation 1:12-18 again. Why, it's Jesus, standing right there with John! 4. Andrew wasn't in the boat with Jesus. In the movie, Jesus first meets Peter and Andrew is missing. How inaccurate! After all, Matthew 4 and Mark 1 tell of Jesus calling his first disciples. We learn that Jesus from the shores called first both Peter and Andrew and then soon after James and John from their fishing boats. No, wait, there's John 1's account. Andrew had met Jesus first and then brought his brother Simon along later to meet Jesus, whereby Jesus renames him Cephas or Peter. Then there's also a fourth account in Luke 5. There Jesus hops into Peter's boat and has him sail just off the shore so Jesus can preach to the people. Jesus then performs the miracle of bringing in a big haul of fish into Peter's net, so many that Peter needs another boat of people to help bring in the haul. Say, what? Three different seemingly conflicting accounts from four different points of view? Not really, likely Andrew took Peter to meet Jesus and then a day or so later Jesus came by to their boat, performed the fishing miracle, and then called the two sets of brothers to follow Him. If the Apostles are not considered apostate for prioritizing differently certain aspects of the story, I can cut the movie some slack for leaving Andrew out of the boat. After all, we see Andrew along with the other Apostles later (though beats me which one of the non-speaking characters he was). 5. Jesus wanted to change the world. Back to that boat scene again where Jesus has Peter cast his nets out and brings in a huge haul of fish, we find Peter properly wowed by the miracle. Being called into service by Jesus, Peter then asks Him what He plans on doing. Just like the Gospel accounts, Jesus replies, "Come, follow me, and I will make you fishers of men." The movie then breaks into a ten minute exposition of what exactly that odd statement means with all the theological implications in missionology, personal evangelism, and kingdom building. Oh, no wait, it doesn't. It only has a limited about of time, so Jesus instead in the movie sums it all up by saying He wants to change the world. Considering that Jesus died to provide salvation, Christianity has become the world's largest religion that toppled the Roman Empire as it grew, and Christ's spiritual kingdom marches on until His physical kingdom comes, "change the world" is exactly what He made happen. 6. Jesus kissed Lazarus' dead head. John 11 gives us the account of Jesus raising Lazarus back from the dead. In the movie Son of God, Jesus raises Lazarus back from the dead. In the Gospel of John, did Jesus go into the tomb and physically touch Lazarus? No, not that we're told. In the movie, was Lazarus wrapped in the proper burial wraps as cultural-historical tradition would have had him laid to rest. No. The movie wanted us to experience Jesus' sadness and love for His friend and to witness the look of life returning to Lazarus' face. Not totally accurate to the biblical narrative, but a creative liberty that made me only appreciate the power and love of Jesus from the Gospel account even more. Also, some have complained that only Martha was there to greet Jesus upon His arrival and not her sister Mary. Clearly the movie on this point knows the Bible better, for according to John 11:20, "When Martha heard that Jesus was coming, she went out to meet him, but Mary stayed at home." 7. This is Roma Downey's Jesus, not mine. Son of God is the brainchild and was produced by Touched by an Angel star Roma Downey and her husband Mark Burnett. Downey it is said is a well-known Catholic. Downey it is said is a well-known New Ager. Downey it is said is a... the list goes on and on from those who hate her movies. Well, which is it? Is she a Catholic, a New Ager, a Catholic New Ager, a New Age Catholic? True, Downey did have her picture taken with Oprah. Hmm, I had my picture taken with Al Gore. Does that make me a tree-hugging global warming enthusiast? There is enough evidence from television and magazine interviews which supports that Downey is indeed a Catholic. I'll be the first to claim that Catholicism is a Christian cult, though I've known genuinely saved people who have stayed in Catholicism because they like its liturgy. Though I can only find third-hand reports, she's supposedly also explored New Age teachings in her spiritual journey, a dead end I heartily tell Christians to avoid. Clearly and without a doubt, in her past she's gotten into some pretty messed up theology. I certainly won't apologize for her past questionable theology. My hands are wiped clean; closed and shut case. Let's move on. I can only though speak for her views of today based on her current works, such as The Bible and Son of God. Downey's background is enough to make Evangelicals walk away and treat her as if a leper, which is exactly what they have done. But, do her odd views translate over into Son of God? Being a spiritual discerner for 40 years, I don't believe so. I'm reminded of Mel Gibson, who also like Downey is a Catholic and on top of it an avid anti-Semite, and he produced the highly acclaimed and doctrinally sound The Passion of the Christ. Even our esteemed C.S. Lewis believed in Purgatory. Whatever church practices she engages in that an Evangelical Christian would never participate in didn't translate over into the movie. Praise God, for He was as Sovereign involved. The accusation "not my Jesus" is a very telling argument on behalf of detractors, though not in the way they might think. Any Jesus other than the real and living Jesus would fall under the prohibition of the Second Commandment against idolatry. And, some have claimed that any movie, television or print piece that has a picture of Jesus is idolatry. Since we're not worshipping those images, it's not. The problem is, we all have our own Jesus. "Not me!" you proclaim. Read 1 Corinthians 13:12, "For now we see only a reflection as in a mirror; then we shall see face to face. Now I know in part; then I shall know fully, even as I am fully known." None of us, I repeat — none of us — have a clear picture of the genuine Jesus. What's told us about Jesus in the Bible is as close as we've got, but reread 1 Corinthians 13:12. We do not have the full, clear picture of who Jesus is. People fill in the gaps by emphasizing a characteristic of Jesus they find most appealing. Some focus too much on Jesus' love, some on His mercy, and some on His wrath. Nobody has the bona fide, all encompassing understanding of the real Jesus, a concept beyond our comprehension as He is God. Someday we will, though, praise the Lord! But, not in this life. Are we all guilty of idolatry then? Sadly, that's a possibility. He who has the full understanding of who Jesus is, throw the first stone at Roma Downey. 8. Jesus finds the destruction of the Temple funny. In the movie, Jesus pokes a little girl in the belly, smiles playfully, and tells her that the Temple would be destroyed whereby not one stone will be left on another. In Matthew and Mark, there is no emotional context for this remark. But, in the Luke 19:41-44 account, we find that Jesus actually wept over the fact that in 70 AD the Romans would tear the Temple down so that literally not one stone was left upon another. The movie clearly went with the non-Luke account and merged the statement with Jesus welcoming the little children. An awkward mix to be sure, but hardly apostate. 9. There were pieces parts left out. Is Son of God a word-for-word account of the Gospel of John? Definitely not. It was told in a story format. That means that some events and teachings were emphasized while others were cut or left out completely. And, by using stories like Jesus loved to utilize, the audience could relate better. For a word-for-word, I highly recommend The Jesus Film. Where I thought the cut was unfortunate was how three times in the movie Jesus made the amazing statement from John 14:6, "I am the way and the truth and the life" but didn't proceed with the rest of the verse, "No one comes to the Father except through me." Though the second part of the verse is vital to our understanding that Jesus alone provides salvation, when you think about it, the first part three times uses the word "the" and not the erroneous "a". Therefore, the movie didn't veer at all towards Universalism as some have erroneously claimed, but went out of its way to say that Jesus is the only way to Heaven. Kudos! There are other complaints people have with the movie. It is, after all, a movie. Who hasn't found fault with Charlton Heston's The Ten Commandments or the animated Prince of Egypt? I think a number of problems people have with Son of God and certainly will have when Noah comes out is that they do not understand how Hollywood works. I refer you to Phil Cooke, a solid Christian and media guru, who as an insider into Hollywood in his article What Christian in the Spotlight Know and You Might Not explains why they take creative liberties when making epic Bible stories. Cooke knows what it's like to be one Christian among many who under Hollywood restrictions are trying to make a difference for the Kingdom through the greatest media ever given us in our efforts to evangelize — movies. Blogger The Last Hiker probably summed it up best about why well-meaning Christians are practically terrified of the movie Son of God. "What if millions of people walk away from this film with a false understanding of Jesus Christ? And what if the Church doesn't notice this as much because we are already so familiar with Jesus, that we may subconsciously fill in the gaps of the story, but the unchurched cannot do that. They don't have the prior reference to be able to do that." What if? Or, what if millions of people who would never come in contact whatsoever to the Gospel message watch the movie and are led to read the Bible and become saved? As the credits rolled and we left the theater, I saw scores of black-uniformed teenagers holding brooms and mops while waiting until everyone filtered out. Never having access to the Gospel, and watching day-in and day-out nothing but violent movies while on the job, here every worker in every theater was getting a chance to learn about Jesus. Sure, they may not leave the theater with a lifetime of Bible study as some Christians have, but didn't the Apostle Paul leave spiritual babies behind wherever he ministered? "Nothing gained is nothing lost" just doesn't work when it comes to evangelism. Or, what if people come away with not a convoluted view, by actually A view of Jesus, where they never had one before? (Which by the way, from this movie they will not receive a convoluted view.) As I was sitting in the theater, a teenage girl behind me said something marvelous. She said, "How wonderful the movie ends with Jesus' promise to return. Jesus is coming back! I didn't know that." Folks, too many people already have a convoluted view of Jesus, and likely we fit in there somewhere as well. This movie actually helps fix that problem. Or, what if this movie does what Phil Cooke's article on Noah, along with his links to the president of the NRB and the Noah movie's consultant, show is a positive result of making movies such as these? That an actually well-done Christian movie (a rarity you must admit) creates a fantastic "water cooler" opportunity to teach biblical truths with believers and as a witnessing tool to non-believers to point them to the full story in the Bible should be applauded, not condemned. People, these movies open a door we'd never have had otherwise. We can share, correct, exhort, and encourage on the various points because that door is now open. After all, it's what the Church is called to do. It just floors me the vitriol spewed by "watchmen" over Son of God and surely soon Noah. We are mad that Hollywood doesn't produce "Christian" videos, and when they do, our expectations are so off-the-chart high that we decry those very same movies and tell Christians not to go see them, whereby due to loss of revenue Hollywood stops making them. Bang! We've shot ourselves in the foot. Instead, I encourage everyone to go see the movies, and then discuss them with others so they can learn to discern biblical truths. We're not spiritual babies who have to be sheltered. By restraining them from attending, your loving protection is only hurting people's eternal souls. Ironic, isn't it? Sure, we live in scary times with genuine apostasy running amok, but you cannot hide in your bunkers. Throw those doors wide open and get on out of there! There's a world out there and we have to live in it for there to be an effective witness for Jesus Christ. God gave us this opportunity with the movie Son of God. So, yes, go use it! Well said, Nathan. It's a movie - it was never advertised as a "home video." This movie has some truth in it without a doubt, and it quoted some scripture partially. But please go back to the garden of Eden and read how the devil twisted God's word to Eve and look what happen. Matthew, Mark, Luke and John were to the Jews. It was all about the temple, laws and The Jews accepting Jesus as their messiah. Paul's gospel that Jesus gave to him was for the gentiles. The gospel in the 4 gospel was to the Jews. Did Jesus ever say to go unto the gentiles in the 4 gospels. Every Jew had to accept Jesus as the messiah. Truth is truth. I hope this movie gets people to reading the Bible. I just don't understand why the producers had to change the Bible. I understand they don't have time to put everything into the movie but why make the changes they did? Why leave out the dove and God's voice at Jesus' baptism? That's a foundational scene depicting the Trinity. Why only one (outspoken) woman traveling with the disciples when the Bible has 3 (or more)? Why change the scene with Lazarus? This has been a great teaching opportunity for my son and I. We've been able to talk about comparing things to Scripture to find the truth. It's also something they will be talking about Sunday at church. No thanks, never relied on Hollywood as a witnessing tool anyway. Do not have time to correct a poor attempt at representing the truth of the Bible to capture a growing market and profit from it. Hollywood has consistingly blasphemed the Lord, I will not reward their ignorance. I MYSELF HAVE PERSONAL CONVICTIONS OF GOING TO SEE MOVIES,I REALIZE THAT THERE IS A WORLD OUT THERE THAT IS LOST,BUT I FEEL WE NEED TO KEEP IT PURE AND TRUE AND NOT MAKE SHOWCASES OUT OF WHAT JESUS REALLY CAME TO DO TO SEEK AND SAVE THOSE WHO WERE LOST.I AGREE SATAN CAN TWIST THE SCRIPTURE AND MANY WILL BE DECEIVED. Thank you for this perspective. I truly have been struggling about this issue since all of the "posts" started streaming onto the various sites. I know many people who will see the movie and am convicted that I need to be prepared to give an answer when they talk about it. Thanks again! "God is not Dead" releasing March 21, 2014 will be a good one to see as well as Pure Flix release of Revelation Road 3. These are worth the money spent to support true Christian enterprises and perspectives. I am not surprised Nathan . I grew up in the 60's and in the 70's whe 'Jesus christ Superstar' came out it was not widely or wildly received ny the churches. I still love that movies. It was crazy passionate and that is what some hate. What ? yes they hate our passion for our Lord. Stand firm a claim all the movies and films that speak to and about ourmLord. God bless. What is further amazing to me is that all the billions various Churches and Christian ministries take in, very few funds are devoted toward such productions. We sadly look for a secular Hollywood to fill the void, that is not the answer, that is just plain stupudity as well as apathy concerning evangelism. I've seen "The Bible according to Hollywood" too many times now. So no thanks. I get fed by the Word. I get fed by programs like the Lamb & Lion videos. I've seen several movies about Jesus and the only one that I care to watch again would be The Jesus Film. And I suppose one could find issues with that if they tried. The problem with movies about Jesus for Christians is we all have our own expectations from them. This is NOT a negative thing. We DO NOT have an obligation to be supportive of these movies. It is OUR choice to see them or not. NO ONE should be critizied for not seeing this movie nor for having issues with it. That being said, NO ONE should be critizied for seeing it and recommending it. So anyone on either side pointing fingers and complaining about the other is wrong. Wanna see it? Great. Don't want to? Great. Why fight over it? Speaking of Christian films - just got Final-The Rapture today. I watched about the first 30 minutes during my lunch hour. So far, so good. It is not what I expected. The story sort of jumps around from person to person and back and forth in time so it was kind of hard to follow for me at first. But once you get a handle on that you can focus better on the storyline. I like the scenes where people go missing because you don't see them suddenly disappear like Samantha on Bewitched. The camera goes off the person then when they go back they are gone and people react. I won't say much more to avoid spoilers (and I haven't seen the whole movie yet) but I am enjoying this movie very much so far. There is are lots of cool bonus features but the best one is an epsiode of a Lamb & Lion television program interviewing the (director? writer? sorry...can't remember for sure) is included! Putting it on a little thick there Billy wouldn't you say! I am not quite sure what you mean or how to respond. I can only speculate and say if I come across as overly enthused about the subject of the Rapture and the ministry of Lamb & Lion and that makes me sound "gushy" about those subjects then I am guilty as charged and not ashamed of it. btw, I finished Final-The Rapture and actually was a little bit disappointed overall with the movie. I think it could be the movie is stylistically different from what I am used to. I'm more used to a storyline that is presented in order, start to finish, without jumping back and forth between characters and timelines as much as this does. It was kind of hard for me to follow at times. Not the movies fault, mine I would say. But I do recommend it. After rethinking over the movie Final-The Rapture I actually would not recommend it (which is my right to do just as others can have the opposite view). For me personally it just fell way under my expectations. I felt the movie was too much focused on the individual stories in the movie and way too less on the subject at hand...the Rapture. It really never explains the Ratpure as we Christians know and understand it. I think that is the biggest failure of it. I would like to have seen just a single family with someone explaining the Rapture to an unbelieving family member who then suddenly finds their loved ones gone. The focus then could have been on this person's experiences of the aftermath. I told a Jewish co-worker about the Rapture before she retired. She had never heard of it. She said if one day all the Christians disappear from the Earth then she would become a believer. I hope she would find Christ before the Rapture, but if not perhaps the seed I planted my grow after it happens. I also explained to her how the events after the Rapture related to the Jewish people. She was like most Jews who believe Christians want the end times so Jesus will return. I explained to her that we will be gone so that is not true. The end times are very much focused on the Jewish people and not the Christians living in today's world.